It's a nice conceptual graphic, but it always jumps out at me that they have the stack rolling out of High Bay 1, rather than High Bay 3. The following is a trade study developed by the MSFC and JSC on utilizing wind biasing to limit the loads and the total angle of attack of the stack on the day of launch. I wish I could find more background material on the subject but I could only find the presentation. An excellent presentation from I believe Oct. 2015 with updates on the Orion/SLS program as well as the US Space program. The presentation doesn't have a lot of ground breaking information, but it does have some very cool graphics and renderings. They are raising the first of the J Platforms out of HB4 for installation this week into HB3. The second J Platform is in the foreground in Camera 083. A liquid oxygen tank confidence article for the world’s most powerful rocket, NASA’s Space Launch System, completes final welding on the Vertical Assembly Center at Michoud Assembly Facility in New Orleans. The liquid oxygen tank is one of two tanks that make up the SLS core stage. Towering more than 200 feet tall with a diameter of 27.6 feet, the core stage will store cryogenic liquid hydrogen and liquid oxygen that will feed the vehicle’s RS-25 engines. Confidence hardware verifies weld procedures are working as planned and tooling-to-hardware interfaces are correct. It will also be used in developing the application process for the thermal protection system, which is the insulation foam that gives the tank its orange color. The liquid oxygen tank is the smaller of the two tanks in the core stage. Components of the liquid hydrogen tank confidence article completed welding in February at Michoud. All welding for the SLS core stage for the Block I configuration of the rocket -- including confidence, qualification and flight hardware -- will be done this summer in preparation for its first flight with NASA's Orion spacecraft in 2018. Animation depicting NASA’s Space Launch System, the world's most powerful rocket for a new era of human exploration beyond Earth’s orbit. With its unprecedented capabilities, SLS will launch crews of up to four astronauts in the agency’s Orion spacecraft on missions to explore multiple, deep-space destinations, including Mars. Traveling to deep space requires a large vehicle that can carry huge payloads, and future evolutions of SLS with the exploration upper stage and advanced boosters will increase the rocket’s lift capability and flexibility for multiple types of mission needs. The first of 10 flight segments for the two solid-rocket boosters of NASA’s Space Launch System has been cast at Orbital ATK’s facility in Promontory, Utah. Casting involves filling the insulated metal case with propellant and allowing it to solidify or “cure” for several days. The hardware, which is the aft segment, will eventually be integrated with four other segments to make up one of the two, five-segment solid rocket boosters for the first flight of SLS in 2018. During this flight, called Exploration Mission-1, SLS will carry an unmanned Orion spacecraft to travel thousands of miles beyond the moon over the course of about a three-week mission and help NASA prepare for missions to deep space, including Mars. Orbital ATK is the prime contractor for the boosters. Flight hardware for the core stage of the world's most powerful rocket, NASA's Space Launch System, finishes final welding and is moved off the 170-foot-tall Vertical Assembly Center at the agency's Michoud Assembly Facility in New Orleans. The hardware is for the engine section, and is the first major SLS flight component to finish full welding on the Vertical Assembly Center. The engine section is located at the bottom of the rocket's core stage and will house the four RS-25 engines for the first flight of SLS with NASA's Orion spacecraft in 2018. The SLS core stage will stand at more than 200 feet tall and store cryogenic liquid hydrogen and liquid oxygen that will feed the launch vehicle’s RS-25 engines. A qualification version of the engine section, which also has completed welding on the Vertical Assembly Center at Michoud, will be shipped later this year to NASA's Marshall Space Flight Center in Huntsville, Alabama, to undergo structural loads testing on a 50-foot test structure currently under construction. All welding for the core stage of the SLS Block I configuration -- including confidence, qualification and flight hardware -- will be completed this summer. Traveling to deep space requires a large vehicle that can carry huge payloads, and SLS will have the payload capacity needed to carry crew and cargo for those exploration missions, including Mars. It is not in a race at all. Attempts to suggest it is are misguided in my view. Progress is being made every day on NASA’s Journey To Mars. 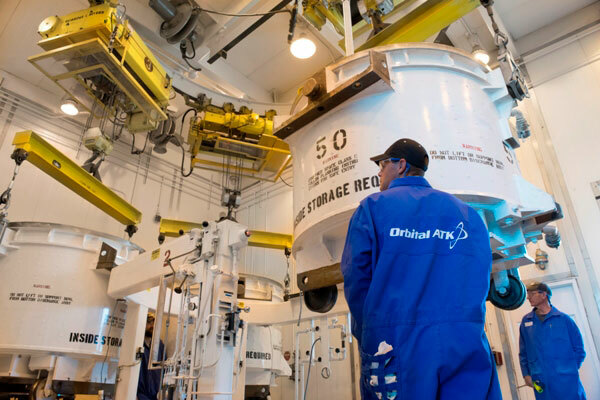 Orbital ATK recently completed casting the SLS aft booster segment for the first flight of NASA’s Space Launch System and Orion spacecraft, EM-1. Casting involves filling the rocket motor case with propellant and allowing it to cure for several days. EM-1 will launch in 2018, powered by two Orbital ATK five-segment solid rocket boosters. Interesting. Do you have any references or documentation on this Vulcan Heavy? I don't believe I've seen anything on that yet. Also, regarding the SLS configuration terminology. There is no Block 0 and no Block 1A. Right now NASA is building SLS Block 1 vehicle with two 5-segment SRBs and the ICPS upper stage. This configuration should be able to put around 95 tonnes into LEO. NASA hopes to replace the ICPS with the 8.4m EUS as soon as possible, making it an SLS Block 1B. Depending on many different factors, Block 1B may be ready in time for EM-2. This configuration should put up to 105 tonnes into LEO. Someday far in the future, Block 2 would replace the 5-segment boosters with advanced composite-wound boosters, or possibly liquid boosters (but probably not). In Congressional theory, this configuration should be able to put at least 130 tonnes of payload into LEO. But probably not. Based on this information, I would have to guess that a Block 1A would be an SLS core with ICPS upper stage and advanced boosters. I don't think that this configuration is currently under discussion at NASA. Right now NASA is building SLS Block 1 vehicle with two 5-segment SRBs and the ICPS upper stage. This configuration should be able to put around 95 tonnes into LEO. Block 1 is 70 t to LEO. Block IB with EUS is 93.1 t to LEO (value from Boeing AIAA Space 2013 paper). That configuration won't be able to get 130 t to LEO without using a five engine core and/or a J-2X upper stage. The first new work platforms for NASA's Space Launch System (SLS) were powered on and tested in the Vehicle Assembly Building High Bay 3 at the agency's Kennedy Space Center in Florida. During a preliminary test April 28, the two J-level platforms were extended to test their motors, tracks and roller systems for functionality. The J-level platforms are one of ten levels of platforms that will surround the Space Launch System rocket and Orion spacecraft during processing.